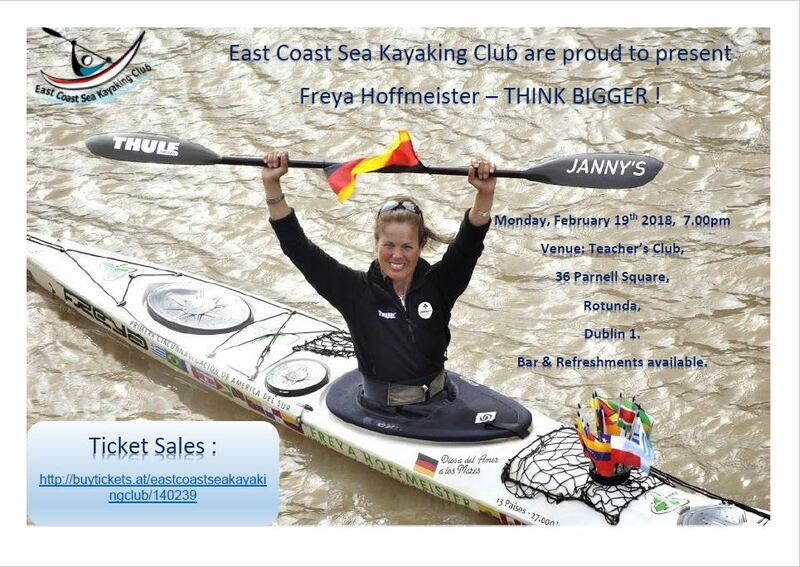 In case you hadn’t heard of her, Freya Hoffmeister will be in Ireland on a whistle stop tour. Please circulate to the kayaking clubs in the greater Dublin region and lets generate some interest within the kayaking fraternity. Canoeing Ireland would like to express their support and condolences today to Alex McGourty and David Higgins family and friends. As already posted on the Canoe sprint Facebook, the Committee of Canoe Sprint Ireland, will hold their Annual General Meeting on Saturday February 3rd, 2018 at 7.30 PM. The Location will be Springfield Hotel Leixlip. Any Motions/Proposals to be considered must be emailed to canoesprintireland@gmail.com by 7.00pm January 26th, 2018. Agenda and additional information to follow. at the Canoeing Ireland Training Centre in the Strawberry Beds, Dublin. Canoeing Ireland are deeply saddened by the deaths of the two Irish paddlers, Alex McGourty and David Higgins, while in Ecuador. Their family and friends have our deepest sympathies and our sincere condolences. Their loss will be felt by the whole community. We extend our condolences to all four of the other paddlers from the expedition. US national, Jeremy Bisson, was found on Saturday while Ecuadorian kayaker, Joaquin Meneses, was rescued two days later on Monday. They are still actively searching for Adam Vaughen. Canoeing Ireland and Tipperary Sports Partnership are seeking a Sports Hub Coordinator / Canoeing Project Officer. This post will be integral to the development and implementation of a comprehensive plan to promote, attract and develop sustainable usage of the Outdoor Community Sports Hub on the River Suir in Tipperary and canoeing nationally. The ideal candidate will have canoeing and a participation background, with knowledge of sport in Ireland and at least 3 years’ relevant experience. Interested applicants should send a CV outlining your qualifications and experience, a letter outlining your suitability and match to the requirements, together with the names and contact details of two people (Relatives or friends will not be accepted) who can comment on your suitability for this position (including your current or most recent employer). Referees will not be contacted without your permission. Applicants should be sent to development@canoe.ie or by post to Canoeing Ireland, Irish Sport HQ, National Sports Campus, Blanchardstown, Dublin 15. Canoeing Ireland is an equal opportunities employer and all applications will be treated in strictest confidence. Successful candidates will only be offered the position subject to satisfactory Garda Vetting and completion of Safeguarding requirements. Canoeing Ireland and the Irish Slalom Committee are delighted to invite paddlers to a C1 canoeing workshop coached by a number of athletes who’ve represented Ireland internationally. C1 is a category of canoeing where paddlers kneel in a boat with a single bladed paddle and these boats can be found across all the disciplines. Ireland traditionally has a great history of this discipline abroad in in competition. Wild Water Racing and Canoe Slalom C1 will be the focus of the day. The event will take place in Wild Water Canoe Club on Saturday the 24th of February starting at 10am and finishing around 4pm. The workshop is open to all ages and abilities! Boats and Paddles will be provided and there is no charge for the day. Anyone interested please contact Robert Hendrick –roberthendrick.rh@gmail.com for more information. We will be running a Coaching Children Programme for a 4 week period beginning on Monday, 19th February. It’s a great opportunity for coaches & volunteers to gain knowledge in this area. 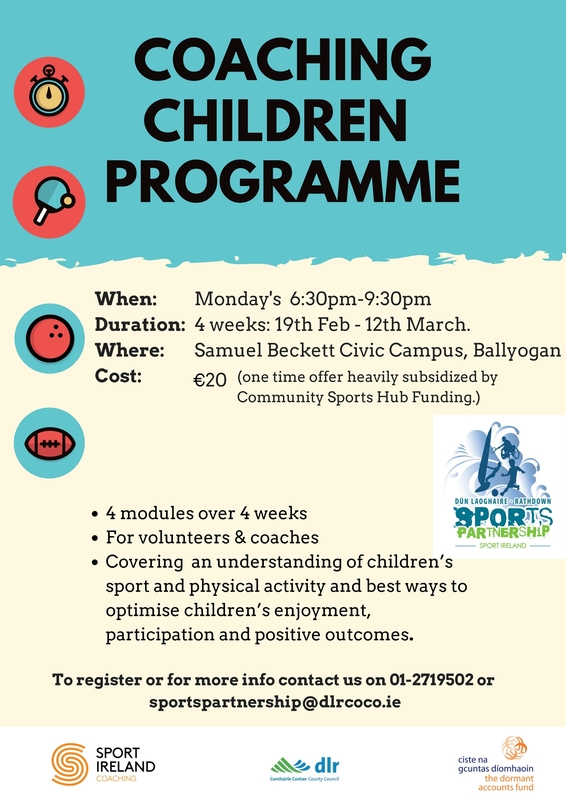 The workshops will take place over 4 Monday’s from 6.30pm – 9.30pm in The Samuel Beckett Civic Campus Ballyogan. If you could please share the attached poster with your clubs, services and contacts it would be greatly appreciated. Please note places are limited & the cost is a onetime offer. To reserve your place on the course please contact sportspartnership@dlrcoco.ie or call 01-2719502. Coaching Ireland have developed 4 modules, specifically to provide particpants with a better understanding of children’s sport and physical activity and best ways to optimise children’s enjoyment, participation and positive outcomes. Workshop 1: Coaching Children Successfully in Sport – An Introduction for Coaches. Workshop 2: Child-Centred Coaching – Understanding Child Development & Learning and its Impact on How We Coach. Workshop 3: Developing Physical Literacy through Sport 1 – Coaching Children to Move. Workshop 4: Developing Physical Literacy through Sport 2. Rachel Sinnott | Community Sports Development Officer |Dún Laoghaire-Rathdown Sports Partnership. County Hall, Marine Road, Dún Laoghaire, Co. Dublin, Ireland. Following the consultation process, I enclose the updated version of the canoe slalom selection policy for 2018. The committee wishes all our athletes the very best of luck in the coming selection races. 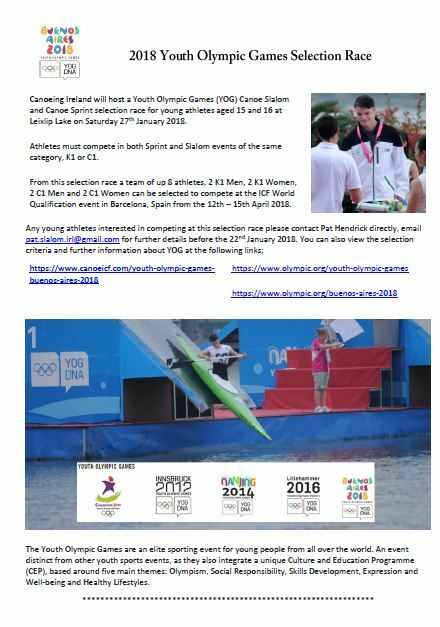 Canoeing Ireland will host a Youth Olympic Games (YOG) Canoe Slalom and Canoe Sprint selection race for young athletes aged 15 and 16 at Leixlip Lake on Saturday 27th January 2018. Athletes must compete in both Sprint and Slalom events of the same category, K1 or C1. From this selection race a team of up 8 athletes, 2 K1 Men, 2 K1 Women, 2 C1 Men and 2 C1 Women can be selected to compete at the ICF World Qualification event in Barcelona, Spain from the 12th – 15th April 2018. Any young athletes interested in competing at this selection race please contact Pat Hendrick directly, email pat.slalom.irl@gmail.com for further details before the 22nd January 2018.